Some people grow up with cats that only live indoors, while others grow up with cats that mostly stay outdoors, but come in during certain times of the year. If you are thinking about adopting a kitten or cat, you might want to discuss the pros and cons of indoor and outdoor cats with a trusted South Coast veterinarian. 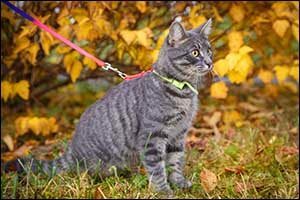 While many people appreciate the “free-range” approach to cat ownership, believing firmly that a cat’s need to roam should be respected; others feel just as strongly that cats should only stay indoors for their health and well-being. Setting the debate aside, it is crucial to consider Massachusetts seasonal pet tips, as it gets much colder in the northeastern states than in many other parts of the country. Having an outdoor-only cat might not be appropriate in New England, so you might want to at least consider seasonal options for indoor access. Other considerations, such as run-ins with local wildlife, parasites, and other outdoor pests, as well as fights with unvaccinated feral or stray cats, should also be discussed when you visit your Dartmouth vet hospital. If you were to speak with a South Coast veterinarian about the indoor outdoor cats debate, the chances are good that they would tell you that indoors is best. The reasons why this has become the stance of professional organizations, such as the American Veterinary Medical Association (AVMA), is that the indoor lifestyle is considerably safer for cats than outdoors. Statistics reveal that indoor cats have a much less likely chance of getting sick or injured than outdoor cats. Overall, indoor cats are proven to live longer than outdoor cats, reaching up to 17 years or more of healthy living. Outdoor cats only survive between two and five years on average, drastically reducing their life expectancy. Indoor outdoor cats can also pose a health risk to humans, bringing in things like fleas, ticks, and parasites that can cross between pets and people. The bottom line is that the risks posed by keeping a cat outdoors outweigh the perceived benefits of socializing with other cats, exploring trees and grasses, or preventing boredom. While some cats will put up a fuss and repeatedly try to get outdoors, owners need to be strong. Spaying and neutering can help significantly in this area, eliminating the primal urge to want to find “dates” outdoors with neighborhood cats. Bad behavior, such as marking and scratching furniture, can also be reduced with the spay/neuter approach. What If Your Cat is Already Outdoors? If you already have indoor outdoor cats, you may want to take precautions to help your cat to live a longer and healthier life. Spaying and neutering are vital to prevent unwanted kittens all over the neighborhood, as well as wandering into dangerous areas in search of a mate. Consider putting your cat in the garage with food, water, and warm bedding at night instead of letting them outdoors, as most accidents and injuries occur at night. Wild animal encounters and getting hit by cars can happen during the daytime but are more frequent when it is dark. Outdoor cat houses can also be custom built and used to keep cats safe when they want to get some fresh air year-round, keeping them warm and protected when it gets cold and out in the “wild” when they demand it. Make sure to bring your indoor outdoor cats to the local Dartmouth vet hospital for check-ups at least twice each year and stay up on all vaccinations. Rabies is essential, but other vaccines, such as FIV for feline immunodeficiency virus and FeLV for feline leukemia virus, can be just as important. Speak with your South Coast veterinarian about other vaccines and preventive measures that you can provide for your indoor outdoor cats. Collars with tags and microchipping can help identify a cat if they get lost or become found by a good samaritan who wants to reunite you. It is also helpful if the cat is injured so that emergency vet services can assist quickly without delay. Schedule an appointment for your indoor, outdoor, or indoor outdoor cats at Anchor Animal Hospital in Dartmouth, MA. We provide a wide range of quality veterinary services for clients throughout the South Coast region, including Southeastern Massachusetts, Cape Cod, and Rhode Island. Call today at 508-996-3731 to speak with one of our team members about your pet’s specific needs.